I have a new favorite mystery. Last Seen Leaving wasn’t even really on my radar until Angie from Lady Knight Reads told me to pick it up. I’m so glad I listened to her. 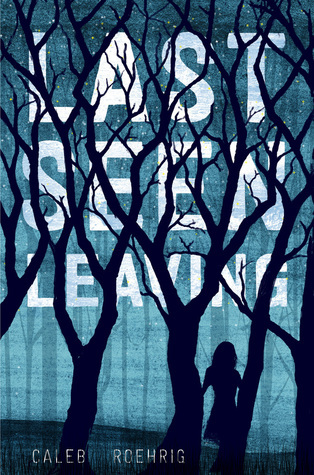 Last Seen Leaving, Caleb Roehrig’s debut novel, is one of those books that I’m going to be pushing on everyone now. Flynn: Characters can really break or make a mystery novel. If your characters are boring and straightforward, you’re going to be able to guess what happened right from the start. Lucky for readers, there is not a single boring or straightforward character in Last Seen Leaving. Flynn Doherty, main character and ex-boyfriend of January, is perfection. I can’t honestly tell you everything it is that I love about him because there is too much. I went through a myriad of emotions alongside Flynn. It was so easy to see how much he cared for January and not knowing what happened to her really tore him up. He was so confused by everything going on in his life. He had no aspirations towards being a detective but he was unwilling to let January’s disappearance go unsolved. He was tenacious and rather fierce when it was called for. He was so loyal and he did not take his friendships lightly. January: You never actually see January except in flashbacks from Flynn’s perspective. She’s very much a mystery. Flynn sees her one way and only starts to realize that there was much more to her once she has gone missing. It’s hard to say what January was really like though because she put on a different face for every person in her life. I think it’s part of what made her disappearance so intriguing and unsolvable. Nobody knew the real January except for January. Mystery: Like I said, this is one mystery that I could not solve. Sure I could figure out little pieces of it but there was always much more to it. Flynn didn’t really have a clue what he was doing when it came to solving the mystery but he was willing to try anything to find out what happened to January. Because of that, he tended to stumble upon things that other people overlooked. He was a little clueless at times and there were times when I wanted to knock some sense into him but he really was a pretty good detective. Romance: The romance in Last Seen Leaving was really very subtle and well done. Flynn obviously had a lot on his plate with January’s disappearance but he ended up getting help from an unexpected source. Kaz was a coworker of January’s who really only offered to help Flynn because he considered January a friend. They got off to a rocky start but Kaz and Flynn were pretty perfect together. Theirs was not a relationship that just popped up overnight though. They both had way too much going on to just jump into things and they really didn’t know each other. I liked seeing them get to know each other and build upon their blossoming friendship. Overall, Last Seen Leaving is an impressive debut from Caleb Roehrig. I’m excited to see what is next from him! This one is in my TBR pile! Caleb was on tour with Fierce Reads last year in my city so I ended up picking up his book there. I love a good mystery and that’s what I hear is good with this one! Lol! Glad to see you thought so too! Can’t wait to read it! Great review!